The new RFS broadcast connector kits are available in North America and suitable for its industry-leading air dielectric cables. 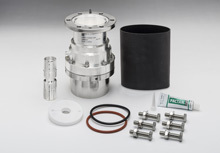 One connector will be available for each of RFS’ popular air cable sizes, and the kits will include all components necessary for convenient installation - including the inner joining kit, hardware kit with O-ring, gas block/pass conversion, connector sealant and heat shrink tubing. RFS has made considerable investments to best support North American broadcasters with the finest quality products as they prepare for the U.S. broadcast television spectrum repacking program, which will require new cables and connectors in order to transition existing equipment.